The scene: Chefs and mixologists in every direction in a Ritz-Carlton ballroom studded with silver and red. Cakes that could win a competition, super tall drag queens, a silent auction with killer prizes and TIM GUNN! The Human Rights Campaign’s second annual Chefs for Equality event was spirited and extravagant. After all, there’s a lot to celebrate this year with the striking down of DOMA! But as always with Best Thing on the Menu, we care first and foremost about the food. After sampling truffled this and that (including popcorn from the Inn at Little Washington! ), a couple warm soups in little cardboard cups, boozy fudgsicles and too many canapés to count, a clear winner emerged. The Best Thing at the Party was, without a doubt, Pabu’s Happy Spoon: Beau Soleil Oyster with Uni, Ikura, Tobiko and a Ponzu Crème Fraîche. This mouthful of raw seafood tastes like someone scooped out a little slice of Tsukiji Market in Tokyo. The uni flavor overwhelms but the texture and sweetness of the Pop Rocks-like tobiko and ikura complete the bite. This was by far the most delicate, complex, decadent dish of the night. We had more than our fill of spoons; we’re to blame if they ran out. 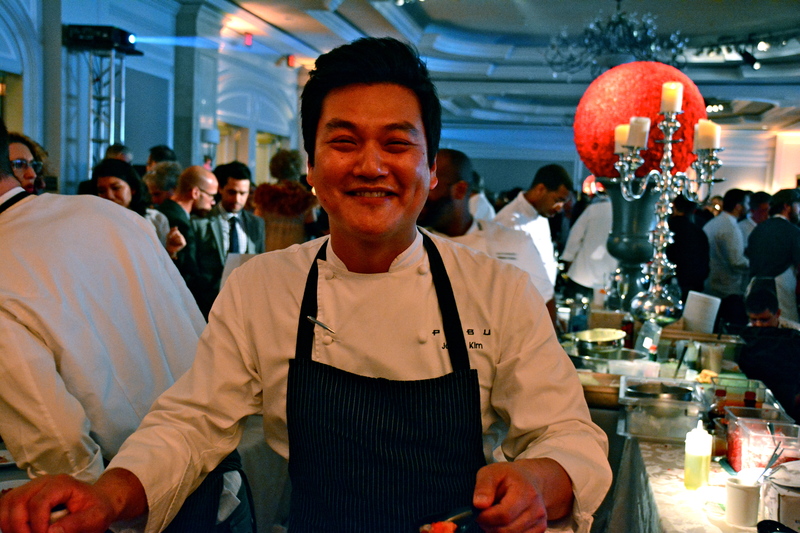 We are now officially inspired to head to Baltimore to visit Executive Chef Jonah Kim and the rest of the team at Pabu. It’s so much more than sushi! They have some of our favorite Japanese dishes including okonomiyaki, miso-glazed nasu (eggplant), Nagoya-style chicken wings and more. Loved grilled food? They even have authentic robatayaki cuisine grilled over Japanese white oak. Oh, and you can get the Happy Spoon! It’s on their regular dinner menu. If you’re a first time Japanese food consumer, take the guesswork out of it and get the Satori tasting menu for under $50. Oh, and in case you’re curious, the mini Pop-Tart from Ted’s Bulletin was The Best Thing in the Swag Bag (BTSB)! Pabu’s Happy Spoon not the Best Thing at the Party? Share your favorites in the comments section and definitely get tickets next year. Washington is a city that revolves around dining – Maybe you’re a 20-something with an insatiable hunger for networking and small plates, or a lobbyist lunching with gentle persuasion on K Street, or just a good friend being dragged to yet another non-profit fundraiser happy hour complete with “heavy apps.” This is all before the weekend hits and we know DCers live to brunch. With all this eating, our waistlines are bound to take a hit that even the most aggressive CrossFit WOD or death-defying pole dancing class can’t fix. Enter Westend Bistro, an oasis of delicious healthy food in a vast desert of trending devilish indulgences. We left our meal guilt-free and extremely impressed. 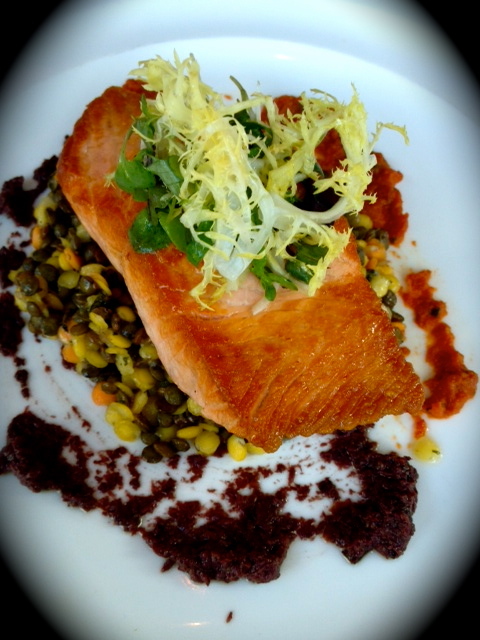 The Best Thing on the Menu: Pan Roasted Salmon with Three Lentil Salad, Lemon-Basil Vinaigrette, Olive Tapenade and Sundried Tomato Pesto appeared in the much appreciated “Bistro Light” section of the menu, accompanied by other mid-section mindful meals. This small portion of the menu includes calorie counts, eliminating the guesswork and mystery. The acidity of the salmon’s accompaniments hid the fact that little to no butter was used, and the plate was so colorful that it added to the satisfaction. Salmon wasn’t the only fish that stood out at Westend Bistro. Chef Devin Bozkaya‘s passion for poisson was quite apparent and we’re not surprised by his marine mastery since his career began in Anchorage, Alaska and continued on to Seattle, Washington. 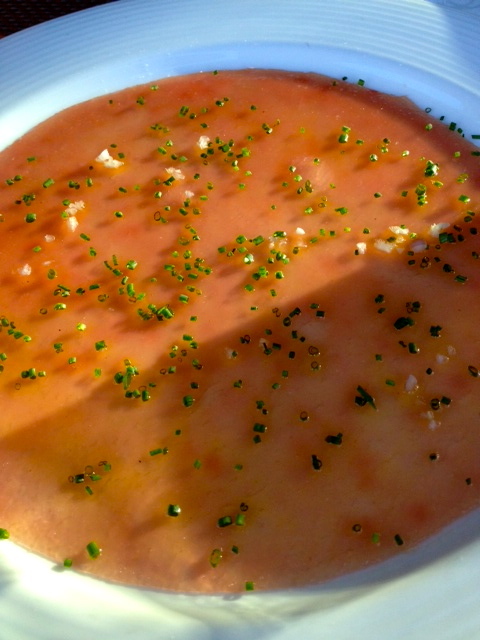 The Tuna Carpaccio was an actual magic trick. It appeared to be one impossibly thin slice of tuna rather than the small circular slices one is accustomed to. 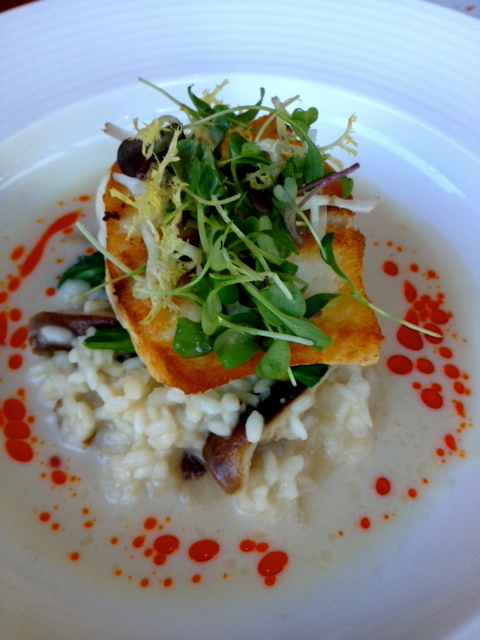 The Pan Roasted Bass with Mushroom Risotto, Lemongrass and Coconut Sauce and Baby Bok Choy was another winner. The Ritz-Carlton restaurant is also a respite from the small-plates craze. With great gusto we each chose the ONE dish that struck our fancy. Committing felt good again. Pan Roasted Salmon not your BTM? Post your favorites in the comments section.